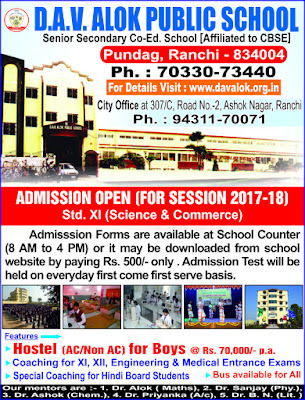 Admission form along with the prospectus for the admission in P.N, LKG, UKG & Std. I to Std. IX & XI(Sci. & COMM.) can be obtained from the school office on payment of Rs. 500/- If parents/ guardians desire to have the form and prospectus by post, they should remit Rs. 550/- including cost of postage by D/D in favour of “D.A.V. ALOK PUBLIC SCHOOL” of S.B.I. or Allahabad Bank or Bank of India payable at RANCHI.